heheheheheeh~ seeing jaejoong’s name in there is making me smile like a psycho! me too! But someone needs to let CJes know properly this time. Last time he won too and I don’t think he knew anything about it….because no article was even released from C-Jes etc. Really? hope Jae wins and gets to receive the award as well. How can we inform C-Jes? perhaps thru jae’s twitter too? I hope more international media will cover this. My Jaejoong…. yep I hope that South Korea article would spread this news!! let Jaejoong and all the people there know that KIM JAEJOONG win this! I’m so happy to see him getting credit as a pop star and ACTOR. ^_^ It drives me nuts that he usually never gets credit for being an actor! Yes!! I voted for him because someone in this site told me to, I didn’t even know about this awards. I hope they mention him since I heard that he won last year too and was not mentioned. Keep it up fans we need to make JYJ’s name known worldwide, one step at a time. LOVE JYJ!! I love it!!! Go JJ!! i am happy he won.^^ i wonder if cjes know about this…. i doubt it but still it would be super nice if he knew that we voted for him. as expected our JYJ’s Jaejoong is the winner … congrats baby …. so happy that JJ won, congrats Jaejoong. “The people’s choice — who got the most votes in each of the featured categories. So meaning Jae is not yet a winner but a finalist (under the celebrity category), I still don’t get it. Does it mean that not all categories have Shorty Award? But to top the celebrity nomination and being listed there as finalist is already a good exposure of the name Kim Jaejoong. Congrats Jae, I made my twitter account just to vote for this, and now I’m starting to explore it. Should we kindly ask Nick Cannon, Alyssa Milano or any of the judges thru twitter to vote for JJ? They probably don’t know (yet) what a beautiful person and artist he is. I should make good use of my twitter account since I created it to vote for him and follow JYJ. Thank you very much @ceskjj for the clarification, I now understand. Hopefully the judges would read more about KJJ/JYJ, what a great prestige if he will be chosen by the Real Time Academy. 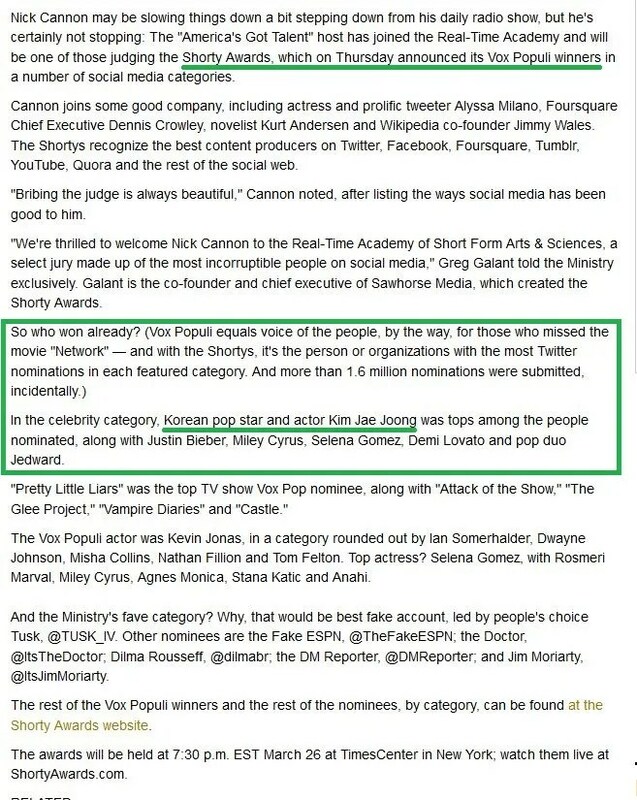 Also according to the website http://blog.shortyawards.com/post/4179396468/announcing-3rd-annual-shorty-awards-winners?87c393a8 it seems that Jaejoong won both the Shorty Vox Populi and a Shorty Award in 2011. Thank you @SnowCrash28 for more information . “Nominees must submit contact information online so award organizers can contact them if they become a finalist.” – I hope @mjjeje has submit his contact information online. *prayhard* Because this year, these Shorty Award winners will be honored at the the gala awards ceremony in New York City. I hope @mjjeje could come to New York. I was one of the voters who vote for him!proudly me……….hopefully he’ll coming to the event. LA Times! Jaejoong’s name written on LA Times article! Sweet! So happy for this news, Lovely Adminie, thank you for sharing. We can comment about this achievement on the JYJ facebook, YouTube channel, and @beyondmonica’s twitter, but also Mr. Egg who may be more familiar with this awards. Congratulations my dear Kim Jae Joong for top election in celebrity category, hopefully in the future, besides the achievements in the field of entertainment also more social and charity activities. The world needs people like him to be able to give an example of peace, and care, especially my concern is the high rate of suicide in South Korea celebrities. So proud of our boys. Congrats, Jae!